As this time of year, you can often determine a football supporter’s age by their reaction to viewing the early season league table. Back in the “good old days”, league tables weren’t published until at least 10 matches in. After all, how much meaning could you take from the standings two or three games into the campaign? These days of course, teams are ranked from the opening day of the season – and any big club starting with a couple of iffy results has their poor position highlighted in the media as a signal of a crisis. What league tables do offer at this stage is a form guide of sorts, as to how teams have got off the mark. And with Bradford City going into tomorrow’s home clash with AFC Wimbledon in 12th position, we can, by literal definition, declare that we have made an average start to the season. A defeat and a win have offered both positive and negative indications about the campaign ahead. But with a buoyant mood derived from an encouraging Tuesday evening tussle with Fleetwood, there is increased optimism that this average start is going to lead to something more than just an average season. Starting with a 3-1 away defeat and then beating a newly promoted side 1-0 at home? That was also the case two years ago under Peter Taylor, who infamously saw his newly constructed side booed off the pitch following an uninspiring victory over a Stevenage side who would go on to earn promotion. This time around, against Fleetwood, there were no boos at full time, only widespread smiles. There’s a natural, pessimistic inclination to rein in giddy excitement and to not get carried away, but somehow it really does seem different this time. At least up to now. It’s worth recalling that last season’s 18th-placed finish included numerous strong home performances. The problem was what happened next. From City looking strong and achieving a notable victory, the players would all too often go onto dismally lose or disappointingly draw their next game. The only consistency occurred in the team’s inconsistency. Which, even at this very, very early stage, represents an important test tomorrow afternoon. And the last thing we need is a flat performance and a poor result, in a way that replicates last season. AFC Wimbledon sit two places below City after similarly starting with a win and a defeat – the latter a 6-2 thrashing to Burton, which at one stage saw the Dons six goals behind. It’s always unsettling to face a team which has just had its backside kicked as you don’t know how they will react, but City will surely be confident of taking advantage of Wimbledon’s apprehensiveness. Following Tuesday’s heroics, the temptation for Phil Parkinson will surely be to pick an unchanged line up, providing injuries and fitness allow. Matt Duke has made a hugely encouraging start to the campaign and looks a different keeper to the hesitant, unsteady stopper who rocked up a couple of days after Parkinson a year ago. After ending last season being told he could find a new club, Duke’s resurgence is even more commendable – and he has even become the club’s goalkeeper coach. Jon McLaughlin is slightly unlucky to lose his place, but the goalkeeper shirt is now Duke’s to lose. In defence the return of Andrew Davies on Tuesday provided a timely reminder of just what a good player Parkinson has managed to sign permanently. Considering Davies’ season effectively ended against Crawley last March – he played only one more time, on the final day against Swindon – in truth I had forgotten just what an outstanding defender he is for this level. Davies’ battle with Fleetwood’s Jon Parkin was hugely compelling, and not many other League Two centre backs will come out on top against the bulky forward over the coming months. Davies partners Luke Oliver, with Rory McArdle pushed over to right back – a position he apparently is less keen to play. I’ve now watched James Meredith four times for City, and on each occasion he has impressed me more than the last. He looks set to prove a solid signing by Parkinson. As does Nathan Doyle in midfield. True enough he still doesn’t look the slimline footballer of his first spell at Valley Parade six years ago, and more work on the training ground is needed over the coming weeks. But even half fit, Doyle was head and shoulders the best player on the park on Tuesday, in my opinion. The early signs are that his partnership with Gary Jones is going to be the driving force behind whatever success City can achieve this season. They controlled the middle of the park against Fleetwood, and have the experience and pedigree to maintain these standards week in week out. On the flanks, Parkinson will hopefully look to continue with two out and out wingers: Zavon Hines and Kyel Reid. The latter’s performance on Tuesday predictably drew some criticism, but I thought he performed what was a more reserved and controlled role fairly effectively. Parkinson revealed after the game that he had demanded Reid defend when City didn’t have the ball, and the winger held his position for much of the evening. Garry Thompson also impressed when he came on as sub and, from what I also saw of him at Notts County, I think he will prove a useful addition. In attack will be the tried and tested partnership of James Hanson and Nahki Wells – which, from where I sit in the Kop, on Tuesday saw the positives and negatives of other supporters. I sit near a huge Hanson hater, and yet again it was 90 minutes of moaning about City’s number nine, only punctured to applaud his goal. I personally thought Hanson had a good game against a strong opposition defence, and his well-taken header underlines once more that he has become a reliable goalscorer. 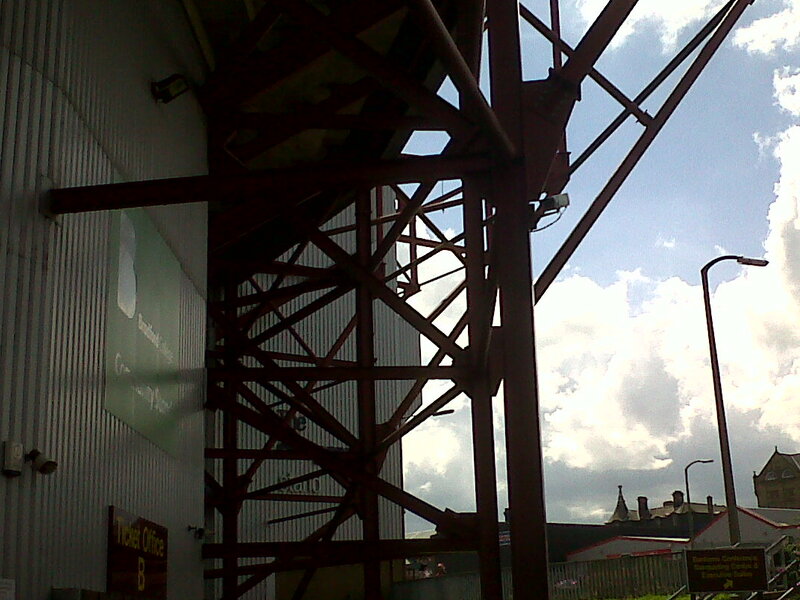 Meanwhile some supporters nearby draped a Bermudian flag over the front of the Kop’s top tier in recognition of Wells. Nahki had a quiet first half, but a much more effective second 45 minutes. On a night where others caught the eye, Wells’ high work-rate and willingness to chase lost causes should not go unappreciated. Ahead of a week that features difficult trips to Watford and Rotherham, the importance of a good result tomorrow, even at this early stage, is high. If this City side really are going to prove themselves to be the real deal and challenge for promotion, they need to quickly develop a winning habit that sees performances and results like the one achieved against Fleetwood a regular occurrence – rather than a high watermark. ‹ The table never lies – or does it? Andrew Davies is class! It isn’t just his ability as a player but as a leader as well. Last week against Gillingham we were 3-1 down and he was stood on the half way line, in a foreign position, clapping his hands and encouraging all of his team mates to fight to the end of the game. He was the same when we were losing to Wimbledon towards the end of last season. His never say die attitude is so refreshing in a profession where the slightest knock in confidence results in heads down and negativity. Let’s hope his attitude is contagious. There has been a tweet from a certain match commentator at vp that a loan deal involving a centre midfield player could happen before the wimbledon game tomorrow. Im sure mr parkinson will stick to the team that beat fleetwoodon tues night. I really fancy us to get a result on sat and feel theres no team we should fear.